Indoor navigation has always been a difficult problem to crack due to the weakness of GPS signals indoor and loss of orientation references such as the sun, signature buildings, and landmarks. TSRB is a multi-functional building located in the heart of tech square, where lots of seminars, labs, networking events and classes are held. Not only do lots of new students and faculties come to TSRB when a new semester begins, but many visitors also come over frequently. Many of them encountered navigation difficulties when they first entered the building. Even for people who have been working/studying in TSRB for a couple of years, they also have problems with finding people, labs, office hours and seminars sometimes. This research project aims to solve the navigation issue by making the building and what happened in the building more "visible" to its visitors on the signage near the front desk (currently it only displays the directory of people and departments). Visitors and people who are working/studying in the building can also interact with the navigation signage using a mobile application. Students in Georgia Tech's interdisciplinary MS in Human-Computer Interaction program do multiple group class projects, and a capstone individual project. Some projects are presented as part of other labs listed here; others are showcased in the MS-HCI Project Lab. 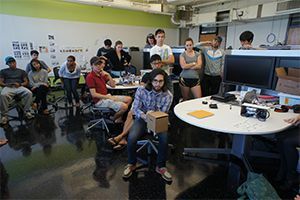 The two-year program spans four schools: Industrial Design; Interactive Computing; Literature, Media and Communications (Digital Media Program); and Psychology. Approximately 50 new students enroll each fall semester.